"Only the 'Old One' could teach him the secrets of the masters." 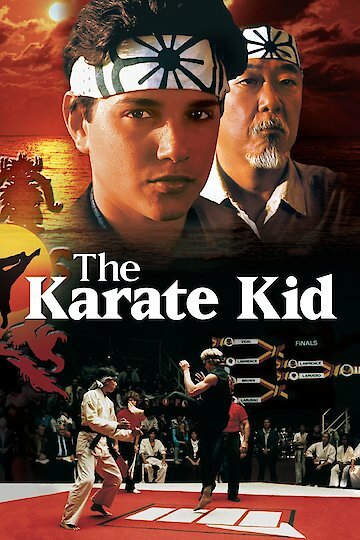 “The Karate Kid” is an dramatic karate movie starring Ralph Macchio as Daniel LaRusso. Daniel and his mom relocate to California from New Jersey much to Daniels chagrin. He does his best to adjust to the California lifestyle and meets a friend who invites him to a beach party. Daniel has a great time and meets a beautiful local girl that he immediately hits it off with. The object of Daniel’s affection is Ally, played by Elisabeth Shue. The two teenagers flirt with each other and start to talk, but they are interrupted by a moped-riding group of misfits led by Johnny Lawrence, Ally’s ex-boyfriend. As Johnny and Ally argue, Johnny busts her radio, which causes Daniel to interrupt. A fight breaks out, and Daniel is savagely beaten by Johnny. Daniel heads to school as an outcast. He suffers several indignities courtesy of Johnny and his friends. Daniel is kicked off the soccer team after an altercation with one of the bullies, and he decides that he wants to take karate classes in order to better defend himself. When he goes to the local karate school, he sees Johnny and his friends are students at the school and are in fact the dreaded members of the Cobra Kai. When Daniel and Ally go to a Halloween party, Daniel is again accosted by the Cobra Kai. They chase him to his apartment building and again beat him up. Daniel is saved by a mysterious man who uses his own martial art skills to fight off the Cobra Kai. The stranger turns out to be Mr. Miyagi, the handyman at Daniel's apartment. Daniel asks Mr.Miyagi to teach him karate. Mr.Myagi and Daniel reach out to the Cobra Kai’s instructor to settle the differences at the state karate tournament. Daniel settles into his training by being asked to perform several seemingly menial tasks. When Daniel doesn’t understand how doing these chores, such as painting the fence and sanding the floors, will help him learn karate, Mr.Miyagi shows that the repetitive tasks are actually teaching him self-defense moves. Daniel continues to pursue Ally, and after some misunderstandings in their relationship, she decides to go to the karate tournament to support Daniel. The Karate Kid is currently available to watch and stream, download, buy on demand at Amazon, Vudu, FandangoNow, iTunes, YouTube VOD online. Once again, rumors are flying about Will Smith and Jada Pinkett Smith breaking up after 13 years of marriage with three kids. Competing insiders are starting (in "In Touch") and squashing (in "Us Weekly") the rumors, and Jada's rep is simply saying "Lord, I'm going back to bed."